Sintered components should be designed based on several shape recommendations, aimed at making compacting feasible, as well as to minimize manufacturing costs. You can download our design recommendations here. – Avoid cylindrical shapes perpendicular to the compacting direction. – Avoid acute tooling transitions, and frontal shapes with thin end sections (knife tip). – Avoid punches with thin wall thickness (< 1,5 mm), and deep and narrow notches. – Avoid frontal holes of diameters lower than 1,5 mm, and blind holes too slender. – Finish the frontal rims with flat end chamfers, and/or cylindrical zones of 0.5 mm in length. 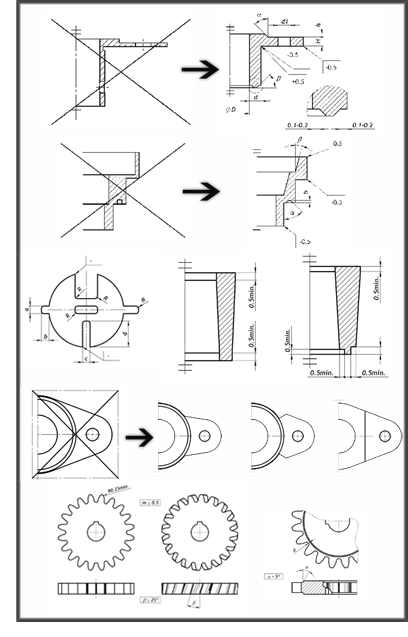 – Avoid geometries that prevent the component ejection from the tool, like undercuts or lateral holes, non-progressive section changes in diameter, knurling, etc. – Introduce de-moulding angles higher than 7º, which could be lower in some cases. The wall thickness of the tool filling cavity should be wide enough so that powder particles penetrate and fill the cavity efficiently. In general terms, a minimum wall thickness of 1,5 mm is required, although up to 0,8 mm is possible in some cases. 4. Integrity of green parts. – Work with a minimum wall thickness of 1,5 mm, although up to 0,8 mm is possible in some cases. – Flanges should have a thickness higher than 2 mm, which could be smaller in some cases. The thickness/width ratio of the flange can not exceed of 5. – Put radii in all the tooling profile, and avoid sharp edges at the ends. – Try to finish the frontal rims with flat end chamfers. – Helical teeth must have an helix angle lower than 25º. – The tooth tips and roots should have radii higher than 0,25. – Minimum modulus must be 0,5, although 0,25 is achievable in some cases. AMES can recommend the most appropriate design to meet your need.Link Contact.